I’m struggling a bit to keep up with all the various ranges by the various reality stars. There’s no doubt that if you love these shows you can cover yourself head to toe with merch from their boutiques, clothing lines, keck ranges (keck means knickers in Yorkshire – don’t say this blog isn’t educational) and online jewellery shops. Nicola (sister of Lauren) has launched a first collection described as “a unique and artistic mix of affordable t-shirts with [Nicola’s] own fun, quirky sentiments about life” – example: My heart belongs to Essex but the rest of me is up for grabs. Reem, indeed. 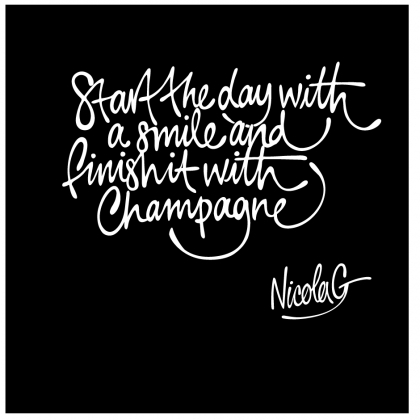 I quite like the tee pictured in the model shot above, which bears a slogan I can definitely live with: Start the day with a smile and finish it with champagne. Nicola designed the t-shirts with artist Melanie Easthope who hand-draws the slogans, adding more cred to the designs. And it’s good to see young artists getting some exposure through the success of the show. The jewellery in Nicola’s range (which also launches this month) is pretty nice too. 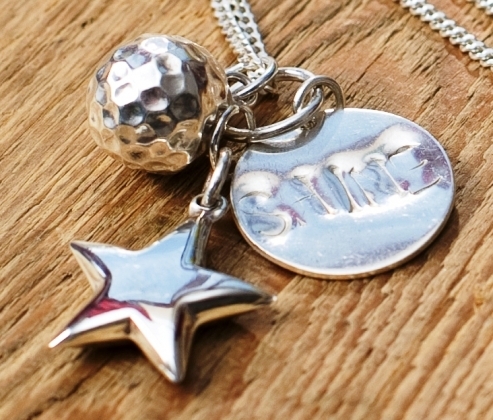 Regular readers will know how I love my stars, and this sterling silver “shine bracelet” may have to be purchased – it’s inspired by parents/kids etc, which also speaks my language. Who knows how well the girls will do with their business ventures, but whatever you think of TOWIE and the rest, seeing so many young women getting stuck into entrepreneurial fashion adventures is heartening; not such a bad thing for younger fans of the show to aspire to.